This work is an essential reference for anyone seeking a book about the status, distribution and vagrancy patterns of rare species within the UK and Ireland, together with a comprehensive overview of Western Palearctic records. 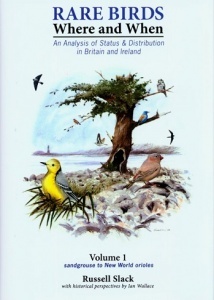 It collates the records for all species presently treated as 'rarities' by the British Birds Rarities Committee (BBRC) and the Irish Rare Birds Committee (IRBC). And a discussion of trends, patterns and why species arrive (or not) and numerous finders accounts.